As the crypto markets go green, cryptos like Stellar Lumens (XLM) are doing it in a whole new style. 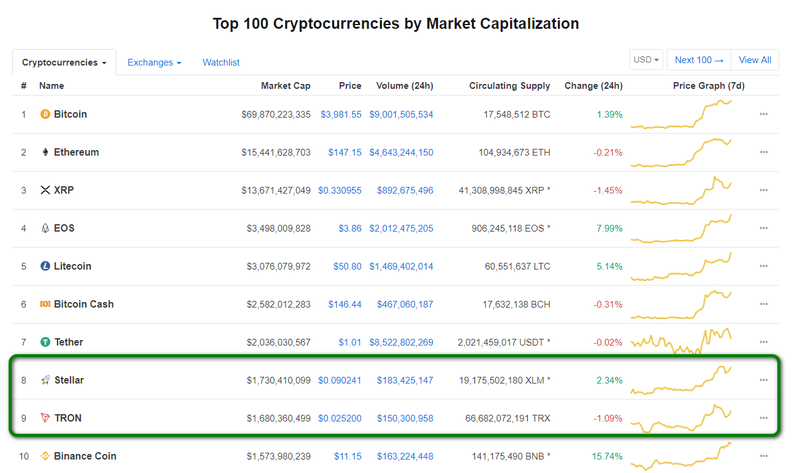 Stellar is now the 8th largest coin by market cap, having toppled Tron’s TRX just a few hours ago. TRX is now stuck at position 9 on the charts. At the moment, XLM boasts a total market cap of $1.7 billion while TRX has $1.6 billion. As is always the case, any good news about a good coin is often followed by an increase in both its price and market cap due to increased trading volume. As for XLM, the surge comes just a short while after IBM’s Jesse Lund intimated in an interview that the big company is planning to partner with Stellar. In September last year, IBM launched Blockchain World Wire, a system powered by Stellar. According to Jesse, the company is planning big things for the system. Also, IBM is planning to partner with various major banks to launch cryptocurrencies. At the moment, Blockchain World Wire covers around 50 countries, with over banks in its system. As expected, the anticipated big announcement about the partnership between Stellar and IBM has sent the crypto’s market standing to a whole new level. Besides the partnership with IBM, Stellar has also scored another success channel with Bitbond, a German-based blockchain-focused firm that offers STO tokens. In fact, Bitbond is the first regulated firm to operate such a business model. Unlike other investment firms, Bitbond announced that it will be paying returns on the invested capital in terms of XLM as opposed to other big cryptos like Bitcoin. This move has also contributed in Stellar’s bullish step-up as it edges out TRX from the 8th position. Besides hinting at the upcoming major announcements, Lund said that he would be making an appearance at the coming event to be hosted in Singapore. The event will feature Lund and Jed McCaleb.